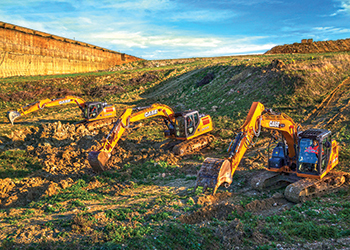 The CX180D, CX160D and CX130D crawler excavators. Case Construction Equipment will show its full line of equipment and services for the construction industry including its offerings for urban construction, road building, aggregates and recycling applications at its 3,216-sq-m stand at bauma. Also showcased will be Iveco vehicles for the construction industry, with the New Eurocargo four-wheel drive on its first public appearance, the Daily four-wheel drive steel three-way tipper, the Trakker six-wheel drive three-lateral tipper and the Astra HD9 eight-by-six rear tipper. “The design of the stand will draw visitors towards a central point where they will discover the most important products being unveiled at the show,” says a company spokesman. Among them will be the 580ST backhoe loader featuring the new backhoe boom and loader arm with in-line cylinder geometry and inner Extendahoe that will be launched at the exhibition. This will be available in addition to the existing Case DNA boom with overlapping cylinders and outer Extendahoe, giving customers the choice of design that best matches their requirements. “Operators looking for exceptional breakout force and great reach will find their ideal solution in the new in-line boom. With 5,520 daN and 4,100 daN respectively, the 580ST featuring the in-line boom design delivers great breakout force both at the bucket and at the dipperstick – and it reaches as far as 6,647 mm from the swing centre,” says the spokesman. The Case DNA boom geometry with outer extendahoe is the perfect solution for tough working conditions, as the sliding part never touches the soil, while the components that do are protected against impact and material accumulation, he adds. The 1021F wheel loader ... to be displayed alongside the 580ST backhoe loader (right). The design with overlapping cylinders reduces the Case 580ST’s overall boom transport height to just 3.5 m, making it easy to transport the machine with no waste of time and fuel. “More time is saved with the patented integrated hydraulic quick coupler, which allows the operator to change backhoe attachments from the cab with the simple flick of a switch,” the spokesman says. New features of the Case SiteWatch telematics system will also be introduced at the exhibition. An extensive range of F Series wheel loaders will be on display across the stand, with units in the aggregates, recycling, road building and urban construction areas. The latter will also showcase the brand’s ranges of skid-steer loaders and mini-excavators, which are particularly well suited to this type of application. The Service and Parts teams as well as CNH Industrial Capital, will also be available to explain all the ways the brand is able to support customers in partnership with its dealers, providing complete business solutions that include tailored financing packages, extended warranty, planned maintenance programmes, competitive cost of ownership, efficient parts and technical service. Three of the machines on the stand – a wheel loader and a skid-steer loader from the road building area, and a compact wheel loader from urban construction display – will also star in a lively show that will entertain visitors on the stand at regular intervals throughout the exhibition. Visitors to the Case stand will also have the opportunity to see the latest products for aggregates applications in action at a gravel pit located in the nearby village of Aschheim. Participants will be able to see demonstrations of the new D Series crawler excavators (only available for the European market), wheel loaders and dozers in action, working with an Iveco heavy-duty truck. They will also have the opportunity to test drive some of the units. 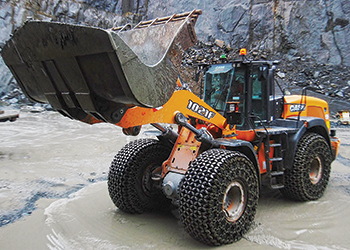 Case Construction Equipment sells and supports a full line of construction equipment around the world, including top-of-the-line loader/backhoes, excavators, motor graders, wheel loaders, vibratory compaction rollers, crawler dozers, skid steers, compact track loaders and rough-terrain forklifts. Case is a brand of CNH Industrial, a global in capital goods.